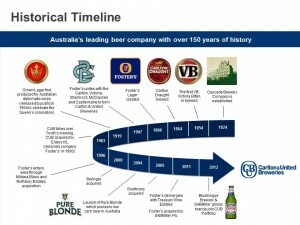 So, I have finally heard back from CUB about the issues raised in this series of articles questioning the ‘official’ history of Crown Lager. It’s still a case of ‘we’re looking into it’, but it seems as though they now accept that the history of Crown Lager predates 1919 and that the footage of the Queen visiting the brewery is incorrect and will be removing it. As for the rest, I had a good discussion with Vincent Ruiu, Marketing Manager, Carlton Group, who acknowledged the questions raised were important ones and they were looking into it. “What you’ve done is great, it meant we’ve gone back and validated a lot of the things that get passed down from generation to generation, or from brand team to brand team,” he said. “Even things on Matilda Bay and on Cascade, I’ve been around here for 15 years and there are some things, particularly with Crown, that just get passed down from generation to generation and you just believe it. Not every time do you check every fact, and what you’ve done is make us go back and do that and it’s been great to walk into some of our archives and see some of that documentation is incredible. I pointed out that there is a massive difference to a beer being sold to an embassy and the claim that it was exclusively commissioned for the Australian diplomatic corps and not available to anyone else. This latter claim appears in the current CUB historical timeline which, judging from the filename (CUB-Historical-Timeline-20120702), seems to have been updated early this month. “The classic example is, I have seen that video of the Queen supposedly in our brewery for 15 years…and I just believed forever and a day that it was right. It’s clearly not and we will take it down and banish it from the history,” Vincent said. “So, (the questions that you are asking) are absolutely valid questions, and they are the right ones to ask and we are doing the work to really understand the right answers to those. Vincent said that there have been positives to the process. “We’ve found records that do correlate to the 1914 date, so it means you’ve found five years of history for us,” he said. So the research goes on. CUB should be applauded for (belatedly) admitting that they have some doubts as to the story and that they are going through a process to clarify the history. However, none of the questions I raised are new or are my own. 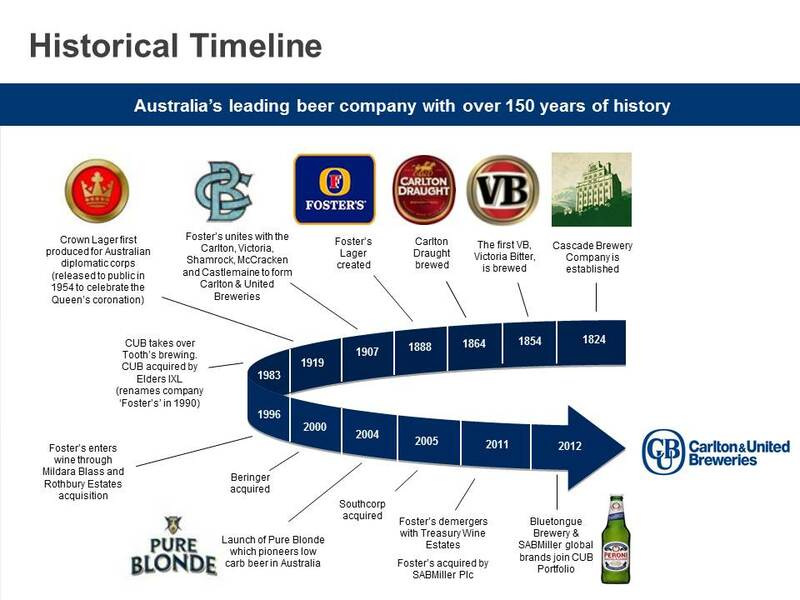 There have been doubts about the claimed history of Crown Lager as long as I have been writing about beer, raised by all sorts of people from enthusiastic beer label collectors through to serious historians. Those passed on to CUB in the past were obviously just dismissed. CUB cannot have been completely unaware of the doubts as to its history. These doubts were simply inconvenient to the marketing juggernaut that is CUB and ignored. As for the ‘we just accepted corporate lore’ line, before they started sending the Queen her annual bottle of Crown Ambassador, I understand a complex negotiation process had first to be gone through before she would accept the gift. I just wonder what version of the history was provided to the Queen during that process. It might have been an idea to look into the story before telling it to the Queen. I’m not sure if it is an actual offence to mislead the monarch, or just really, really bad form. It is also apparent that CUB have a massive store of brewery history locked away and scarcely used. At the same time there are serious researchers and genuine enthusiasts who would kill to have access to this valuable store of Australian beer history. While it is great that CUB are finally delving into their own history, any confusion about the origins of their biggest premium brand would have been avoided by giving professional historians unfettered access to their archives. I understand that access to this is rarely granted and, when it is given, is highly conditional to avoid potentially embarrassing revelations, such as they are facing now. CUB can’t lock away its history to avoid potential embarrassments on one hand and then sheepishly admit they were wrong when other evidence comes to light. If CUB is genuinely interested in and proud of its history, be open about it. Don’t hide it away from public view only selectively drawing on it to make unsubstantiated brand claims such as appears to have occurred in this case. The history and heritage that they claim to be proud of isn’t just the series of trademarks and brand names that they trot out from time to time. That’s marketing, not heritage. We will keep you posted on CUB’s research into the history of Crown and let you know what they turn up. Brad and I are really enjoying this ‘detective’ series. Also off to google Andrew Bailey, we’d love to see his label collection.